May we stretch this to “vacuuming” or “flag trodding”? May we include the audience or onlookers as performance members? 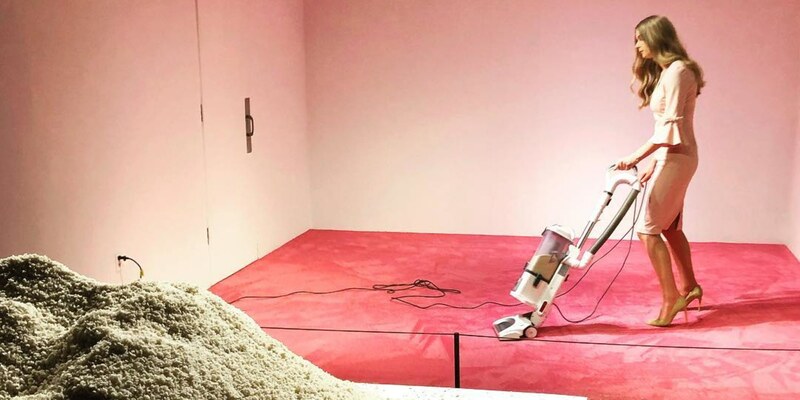 If so, I offer two examples of performance art: Jennifer Rubell’s Ivanka Vacuuming, currently at the Flashpoint Gallery in Washington, D.C., the art performed daily until February 17, 2019; and Old Glory: The American Flag in Contemporary Art, an exhibit at the Phoenix Art Museum in 1996. A vast continent separates me from Washington, D.C., and, alas, I’m unable to contribute to the vacuuming. However, Wife Dottie and I had involvement, albeit minor, in the Phoenix performance art. Ivanka Vacuuming has an Ivanka Trump lookalike vacuuming a pink carpet, two hours each day, in a portion of the art gallery. Nearby is a huge pile of bread crumbs, with onlookers encouraged to toss handfuls onto the carpet. Ivanka Vacuuming, by Jennifer Rubell, currently at the Flashpoint Gallery, Washington, D.C. Image from and abc7dc video at wmagazine.com. “Ivanka” is vacuuming in high heels and wearing a dress reminiscent of one the real Ivanka wore to the G20 meeting in Hamburg, Germany, July 2017. 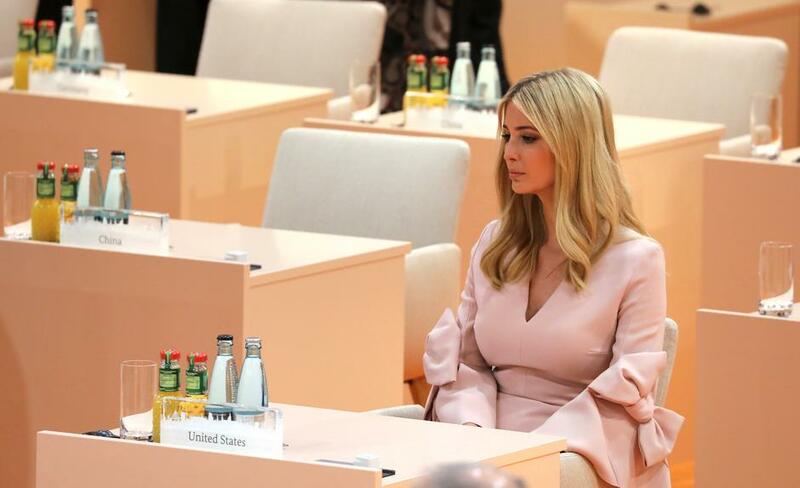 The real Ivanka at her father’s seat at the G20 meeting, Hamburg, Germany, July 8, 2017. Image by Ludovic Marin/POOL for REUTERS. Trump’s tweet: “Sad, but not surprising to watch self professed “feminists” launching sexist attacks against @Ivanka Trump. In their crazed world, sexism is OK if it hurts their political enemies. Discuss: Compare Donald J. Trump’s tweet with Harry S Truman’s retort to the music critic’s view of his daughter’s soprano recital. Extra points: Compare Margaret Truman’s singing with Ivanka Trump’s business ethics. Old Glory: The American Flag in Contemporary Art was an exhibit at the Phoenix Art Museum back in 1996. Previously it had been in Cleveland (where it was curated) and Colorado Springs, but Phoenix was where several of its elements gained notoriety. 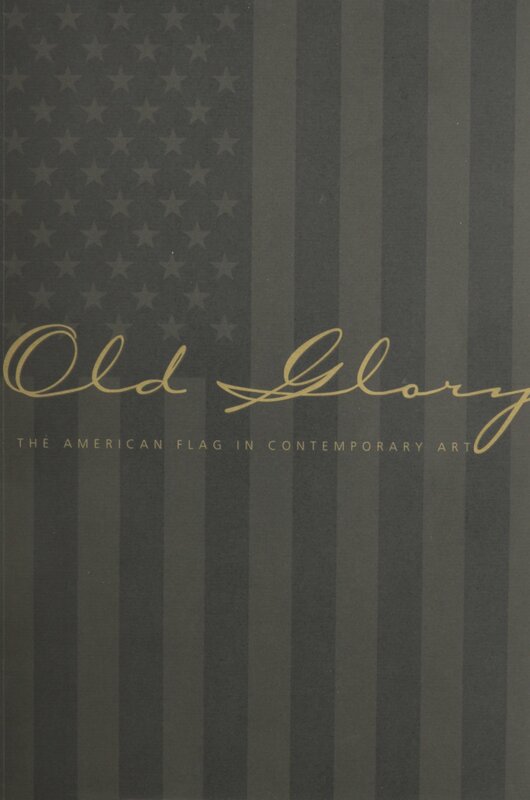 Old Glory: The American Flag in Contemporary Art: Exhibition Catalog, Cleveland Center for Contemporary Art, 1994. One of its most controversial elements was What is the Proper Way to Display a U.S. Flag? It had a photomontage of flag use and abuse, a visitor book for comments, and, in the most direct approach to the visitor book, a U.S. flag stretched out on the floor. What is the Proper Way to Display a U.S. 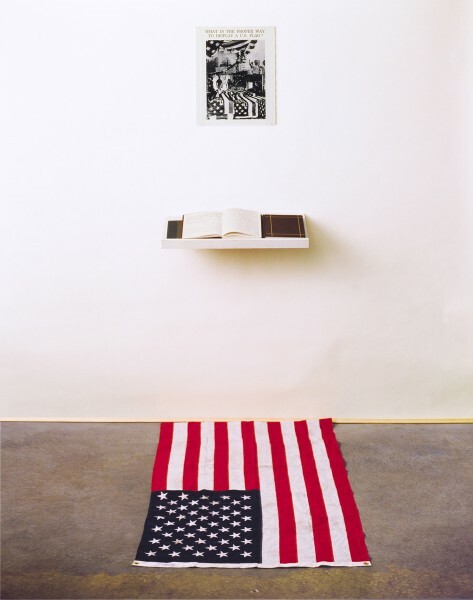 Flag?, 1988, by Dread Scott, professional name of controversial American artist Scott Tyler, Chicago-born 1965. This installation and others generated controversy, some erupting during the Copperstate 1000 old car rally, held annually to benefit the Phoenix Art Museum. 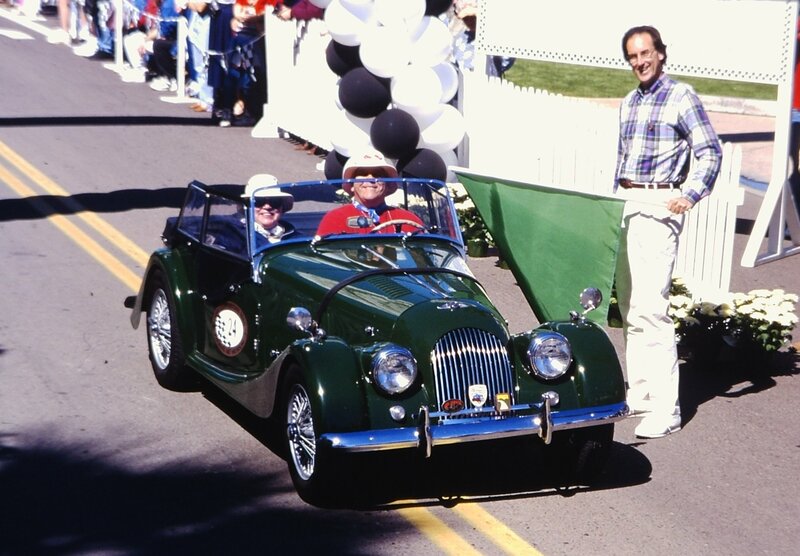 Phoenix Art Museum director Jim Ballinger waves Wife Dottie and me off in the 1995 Copperstate 1000. 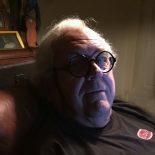 We knew Jim Ballinger, long-time director of the museum, through our participation in the Copperstate over its first decade. I recall inviting him to navigate one year on part of the rally route. Indeed, it might have been 1996, when the museum had Old Glory: The American Flag in Contemporary Art as its principal exhibit. This entry was posted on February 15, 2019 by simanaitissays in And Furthermore... and tagged "Ivanka Vacuuming" Jennifer Rubell Flashpoint Gallery Washington D.C., "Old Glory: The American Flag in Contemporary Art" Phoenix Art Museum 1996, "What is the Proper Way to Display a U.S. Flag?" protest artist Dread Scott (Scott Tyler).